If you are looking for endless beauty, sumptuous cuisine and wonderful and unique activities, then Rouxwil Country House is the place for you. Rouxwil Country House is a working wheat and sheep farm, situated in the heart of the Cape Overberg, between Hermanus and Franschhoek, close to the towns of Greyton and Caledon. For the ultimate experience in Overberg accommodation hospitality, stay at Rouxwil Country House in South Africa. You can savour the excellent cuisine, go on a personalised farm tour, sip sundowners in nature, or just relax and be pampered. Stylish cuisine is served in the Manor House, either in the tastefully decorated lounge, in the intimate old farm kitchen, or on the spacious veranda with its huge fireplace. Taste some of the traditional South African foods like “waterblommetjies” and beetroot, “snoek and patats”, bread and homemade jams and cheeses, or venison and quinces. The highlight is an unforgettable braai (barbecue), the real South African way. Due to the wine knowledge of the owners at this country house in South Africa, every meal is an artistic creation complemented by the best wines. You might even get invited for an after dinner port in their private underground cellar. Only the best, freshest local and self-produced ingredients are used. 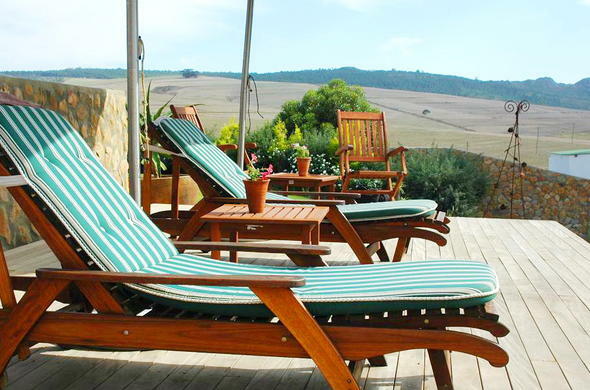 Rouxwil Country House in the Overberg, Western Cape welcomes children over the age of 12.